By domipj, November 27, 2012 in Help, my PC is infected! Bonjour, y a t'il quelqu'un qui puisse m'aider ? J'ai le virus mentionne en objet ( Rootkit Vrabber A) . Sur deux machines. win7 et Win7 X64. Comment dois-je m'y prendre j'ai essaye plusieur chose mais rien n'y fait. Je joins deux rapports fait avec ZHPDiag. Welcome to the Emsisoft Support Forums. My name is Kevin, and I will be helping you fixing your problems. Do not start a new topic. The logs that you post should be pasted directly into the reply. Only attach them if requested or if they do not fit into the post. If the original logs are for more than 1 system, start a thread for the other system. Working on more than one system in a thread can lead to confusion. Stay in your original thread. Do not start new threads for the same support issue. Double-click on TDSSKiller.exe to run the application. NOTE: Do not use the computer during the scan! If you have files that are shown to fail signature check do not take any action on these. Make sure you select Skip. I will tell you what to do with these laater. They may not be issues at all. If Suspicious objects are detected, the default action will be Skip. Leave the default set to Skip. Make sure that Cure is selected. Important! - If Cure is not available, please choose Skip instead. Do not choose Delete unless instructed to do so. [*]Click Continue to apply selected actions. Reboot immediately if TDSSKiller states that one is needed. [*]Whether an infection is found or not, a log file should have already been created on your C: drive (or whatever drive you boot from) in the root folder named something like TDSSKiller.2.1.1_27.12.2009_14.17.04_log.txt which is based on the program version # and date and time run. [*]Attach this log to your next reply. Sorry for ne new topic, I didn't understand write.! Run TDSSKiller again and this time quarantine the RootKit detections. Double click on Combo-Fix & follow the prompts. 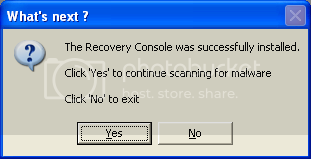 **Please note: (This applies to Windows XP systems only) If the Microsoft Windows Recovery Console is already installed, ComboFix will continue it's malware removal procedures. When finished, ComboFix will produce a log. 1. Do not mouseclick combofix's window while it's running. That may cause it to stall! 2. Remember to re-enable your anti-virus and anti-spyware before reconnecting to the Internet. Let me know of any problems you may have encountered with the above instructions and also let me know how things are running now! Go ahead and let ComboFix run. Go ahead and restart the system. The machine stop alone Kevin. And every time I try to run combofix it seem that it creat troubble with the video card. Now I m just after Kaspersky operation? How shall I continue ? Shall I start emisoft anti virus again? Read all these directions before proceeding. When you have the .ISO file downloaded, you need to create a bootable disk or flash drive with it, using a clean PC to do that. The .ISO file is a disk image. It should NOT be burned as a regular file. You need a program like ImgBurn that can burn an .ISO image. I think a CD is best as there is no way anything can write on it after it is made, but the USB may be more convenient and easier. How to record Kaspersky Rescue Disk 10 to an USB device and boot my computer from it? How to record Kaspersky Rescue Disk 10 to a CD/DVD and boot my computer from the disk? Go to a clean PC. 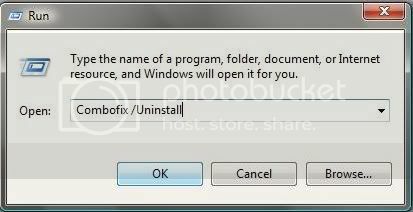 Download the .iso image file. Create a CD (or flash drive if you prefer). At the infected PC: put the disk in the drive and reboot. Follow the directions here, but you will find some differences. Familiarize yourself with How to create a report file in Kaspersky Rescue Disk 10? Restart your computer and put the disk in the drive while booting. Press any key. A loading wizard will start (you will see the menu to select the required language). If you do not press any key in 10 seconds, the computer boots from hard drive automatically. Select the required interface language using the arrow-keys on your keyboard. Click 'A' to accept the agreement. On the upper part of the Kaspersky Rescue Disk window, click on the Report link. On the bottom right hand corner of the Protection status - Kaspersky Rescue Disk window, click on the Detailed Report button. On the upper right hand corner of the Detailed report window, click on the Save button. After clicking Detailed Report and 'SAVE', a browse window opens. All your drives will be shown and you can easily double-click C and save the report to C:\KasperskyRescueDisk10.txt. The report has been saved to the file. [*]Remove the disk from the drive (or disconnect USB) and reboot normally. Attach KasperskyRescueDisk10.txt to your reply. here is the document report. Im running now the emisoft anti-virus. let me know what to do with the dirty files. Looks like KAV10 found and repaired a boot sector infection on 2 other drives, everything else was in the TDSSKiller Quarantine folder. Let me know the results of the EAM scan. EAM i ok in smart scan and looks ok in deep scan also. do you need the report ? Yes, please attach the scan report. Sorry Kevin, Im not shure wich one was the smart because I had to restart the machine because of a driver troubble. Your last set of logs look fine. Unless you are having problems, it is time to do the final steps. Then go back to and click to run it. Turn off System restore to flush all your restore points then turn system restore back on. See How To Enable and Disable System Restore. Run the Secunia Online Software Inspector, this will inspect your system for software that is out-of-date and in need of updating. Update anything program/application detected as being out-dated. ok, I did all the task.Did not read the doc yet but I will do it ! Thanks a lot for your nefficient help. If you need any report or feed back just say it. All posters requesting Malware Removal assistance are required to follow all procedures in the thread titled START HERE, if you don't we are just going to send you back to this thread.